The Perfect Nativity Service: Carols and a play! No rehearsal required: Rehearsals are a luxury, not a necessity as script prompts or voiceovers can be used on the day. Carols: Whilst music is not provided, carols/hymns are suggested for the congregation to join in with at appropriate points in the nativity play. The narration and actors’ lines are written entirely in rhyme, a proven way to make the script easier to remember should you choose to rehearse and perform it, although the script prompt cards that are provided make the play aspect of the nativity service possible to do unrehearsed. A fully prepared nativity service incorporating a simple play and blended perfectly with your own choice of Christmas carols for the congregation to sing..
• A simple repeating rhyming pattern to introduce optional small, rhyming speaking parts for actors. • 2 optional opportunities for simple, effective songs by both Mary and the angels. • optional singers and dancing angels. • The script includes 2 optional short, simple songs with sheet music and backing tracks: a lullaby for Mary, and a song of praise for the angels. 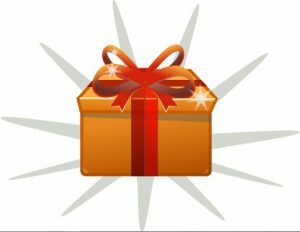 If you’re ready to buy THAT WONDERFUL GOD-GIVEN FIRST CHRISTMAS DAY, click on the ADD TO CART button below, or continue reading if you need more details. Click here to see how simple and effective this script really is and how easily you could put on your own nativity service. A leader who introduces carols etc. An optional extra cast of up to 16 actors with an average of 1 or 2 short rhyming couplets each. This script can include as few actors as you choose without altering the script length, as a voiceover can say any lines that actors omit. It is suitable for any age cast and ability, although the storyteller(s) must be confident readers. It therefore lends itself perfectly to a mixed age cast, and mixed abilities, and even to an unrehearsed community performance of volunteers. Up to 16 speaking parts (averaging 1 or 2 rhyming couplets) these being Mary, Joseph, Angel Gabriel, Angel 2, Angel 3, Emperor Caesar, Roman Soldier, Innkeeper, 3 shepherds, 3 kings, King Herod and a star. If you choose not to include these as actors, you may still use the lines to avoid reducing the script, maybe by holding up a picture of the character and using a voiceover, for example. There are also 2 optional free extra poems ; one summarises the message of the play (ie, Is this simply a story, or do we actually believe it? ), and the other being my trademark “Roll Call Poem” wherein each participants stands to say a couple of lines acknowledging their role in the play. Mostly the script simply suggests popular hymns/ carols for everyone to sing together rather than the children performing as part of the play. Alternatively, you could use the children’s past favourite songs to keep things simple. A lullaby for Mary to sing to the sleeping baby Jesus, either as a solo or with a choir of children. This uses the tune of “Hush Little Baby, Don’t say a word” but with my own alternative simple lyrics. A song of praise called “Glory to our God on High” to be sung by the host of angels to the tune of “Twinkle, Twinkle Little Star” using my own alternative lyrics. If you really do want to include some simple songs for the children to perform, look at my other scripts too (listed at the top right of the page or scroll towards the bottom of this page) as all of my songs will work with different scripts. Songs are, of course, optional and your own choice so will lengthen the service as much as you choose according to what you include. These timings will, of course, be reliant upon everything flowing in a calm, fully rehearsed way without delays to get actors in position etc. which depends very much on how you do things and can make quite some difference over the whole of the play/service. Rehearsals are a luxury, not a necessity, as printable script prompt cards are provide for actors, and parts are all clearly introduced. If you choose not to include actors a voiceover can say or read their lines from either on or off stage. Any rehearsals however, will of course make for a more polished performance and allow you to judge more efficiently how long it takes to get actors in place on stage and whether there are any potential practicalities to be considered etc. They alos help the actors to feel more confident that they know what to expect. Just £9.95, for an instantly downloadable pdf document of the script, including sheet music and downloadable mp3 backing tracks of the music. Alternatively, I highly recommend upgrading your purchase for just £2 extra, to receive all of the above in addition to A WORD DOCUMENT of the script to customise and personalise for your own nativity play. It really is invaluable when it comes to personalising the script and distributing lines etc. For we on this God-given Christmassy day told Jesus’s story in our special way. But can we just say…. On present-filled, God-given Christmas Day we hope you’ll remember our Christmassy play. So what DID it say? How could it relate now to me and to you? Could we leave you thinking of that special day? Of that wonderful God-given first Christmas Day. If you’re ready to buy the That Wonderful God-given First Christmas Day, click on the ADD TO CART button below, or continue reading if you need more details. So, how much does it cost, and what is included!? I pride myself in making my scripts the best value for money around, so That Wonderful God-given First Christmas Day nativity service, including 2 songs with sheet music and FREE music mp3 files, and script prompts ready prepared can be downloaded instantly to your computer for the special low price of just £9.95. this is a one time investment as the script can be re-used without any license fee being incurred. Miss out or change songs, add prayers or introduction to the offering etc. A “Nativity Roll Call” performance poem and message to the audience : a fabulous and unique finale for any traditional nativity play. Again, all in rhyme, this gives everyone involved the opportunity to take a bow as they say their own individual line. This has been so well received that I now write one for every script. 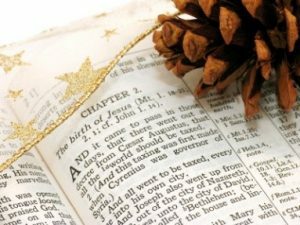 “That Wonderful God-given First Christmas Day” : A purpose written Christmas rhyming poem which can, if you choose, be read out to round up the message at the end of your nativity play. 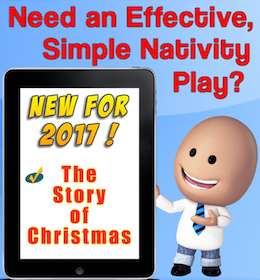 Grab your LICENCE FREE COPY of That Wonderful God-given First Christmas Day nativity service script at the ……. How about the gossiping innkeeper’s wife telling the traditional nativity story using her diary, with her somewhat downtrodden husband, and the narrator correcting her version of events from time to time! Would you prefer to use your own choice of songs/carols, or combine your nativity play with a church service and congregational hymns? If so, our price for the following options is EVEN LOWER!…. Still prefer That Wonderful God-given First Christmas Day? Ps. If you are still not sure, remember that you don’t have to take my word for it. Read the fantastic testimonials that I have received, from teachers and nativity organisers who have used the scripts.